Rain in the auction pen. She's in the red halter. We didn't discover until later that Maria had taken a picture of Rain. Before the auction started, we picked out seven horses (an almost impossible task) and wrote them down. Then we went to the hallway where the horses are literally run past you as the auctioneer does his thing. The auction moved so fast it was unreal, about 50 horses through in less than 20 minutes. It took me a few minutes to get my bearings. There was a chestnut thoroughbred we wanted that went first. She was skinny and broken, but very, very friendly. I think the meat guys knew we wanted her. I bid her up to $275.00, but I had to let her go. It broke my heart, but we only had so much money to spend and we were was bound and determined to save four. I was looking hard for the Belgian Draft Mare we picked out. I saw her coming up and I was terrified I would lose her too. Out of the left corner of my eye, a little bay horse with her head down to her knees tried desperately to walk through the tunnel of people. There was a man hitting her through with a stick because she wasn't walking fast enough. It was as if her front feet were walking on hot coals. The pain she was feeling was obvious. It was easily seen all over her face. 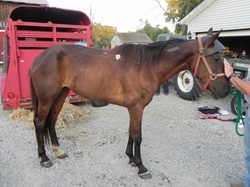 She wasn't even one of the horses we had picked out, but suddenly my hand went up and I was bidding on her. Maria poked me in the side and she said "What are you doing?! ", I said "I don't know!!" It was as if my hand disconnected from my body and I bid on her without even meaning to. She became ours for $90.00. When we went to the pick up pen to get her, she was standing in the back corner of the pen. When we walked up to her, she tried to hide from us by putting her head behind a piller that held up the pen. The sadness in her eyes was undeniable. We had to give her a lot of painkillers to make her more comfortable and then we put her on the trailer. Rain in pick up pen after auction. She could barely put her left front foot on the ground. I found out by her freeze brand that she is a Racing Standardbred Pacer. Her name is "Time of my Life" and she last raced in 2008 and won $21,000. She probably started to break down and was no longer winning, so she was most likely sold to the Amish who turned her into a cart horse. When they break down again to the point they can no longer do that, they're taken to the nearest auction and dumped. Their end is ALWAYS the slaughterhouse because by now they're so broken nobody else wants them. Rain right off the trailer. Vet doing hoof test. It looked like somebody cut her feet short, shod her, then ripped her shoes right off. It's why she couldn't walk.